Books for Your Back Pocket. jotters suitable for gifting. (featuring Poppy’s paintbrushes). I have a fondness for books. I love the structure, and the variety. I like that they can hold secrets or daily-ness. They can contain personal wishes or public proclamations. They can house technique-testing or sketches or big ideas. I make books for all seasons, and just as a creative exercise. I also make small, pocket-sized jotters for lists. Lists of art supplies and groceries and to do’s. 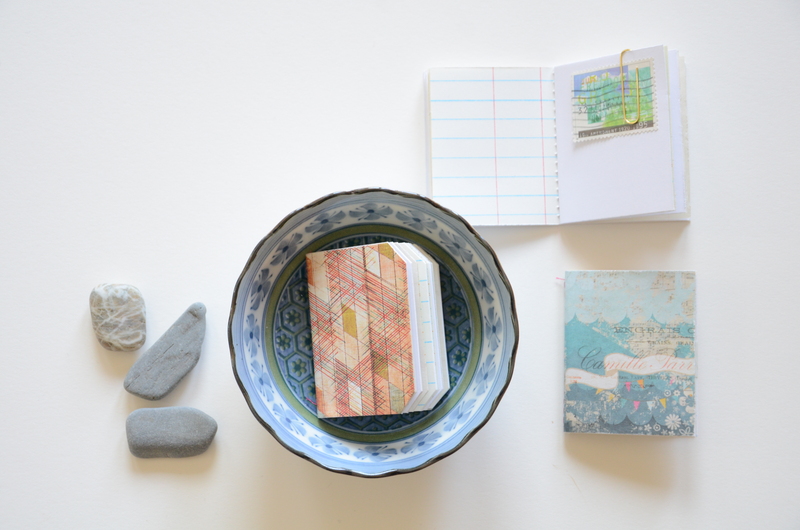 It began as a way to use up small scraps of ledger and patterned paper. I bind these jotters with waxed linen in a pamphlet stitch. Simple, and purposeful. I have, on occasion, gifted these jotters as opposed to a card, and I affix a greeting with washi tape. And I often collage or otherwise embellish the front—you know, for fun. Big Ideas for 30+ Little Projects. 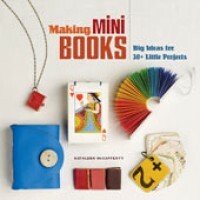 Making Mini Books, edited by Kathleen McCafferty, is arranged from the simplest matchbook projects to the more elaborately sewn accordion books, and includes an appendix to help guide you through an assortment of sewn bindings. It features the work of 22 book designers, and 30+ projects in total. Any level of book-maker can leap into this volume and find a do-able project without needing any elaborate supplies. My journey through Making Mini Books made my art room look like a recycling tornado swept through. 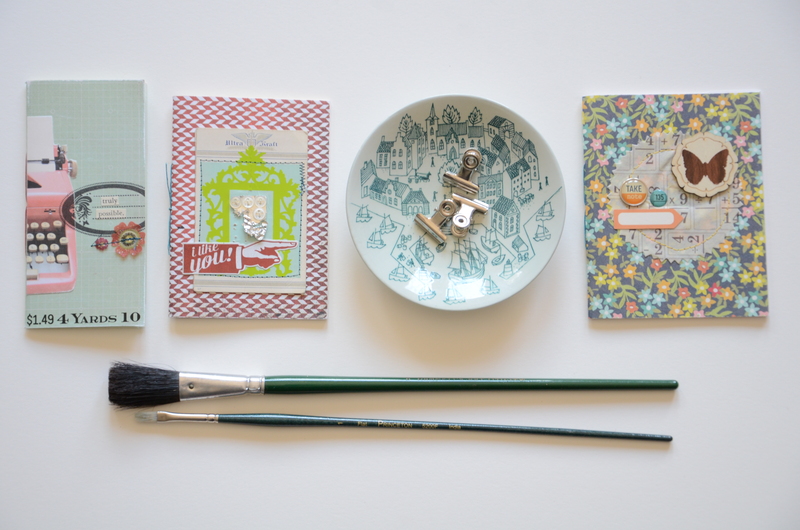 Vintage papers, maps, patterned scraps—everywhere. The tail ends of waxed linen thread, scattered buttons, and leather snippets. The books may be tiny, but I made a huge mess. I wish I took before and after pictures. First, I made the simple matchbooks, designed by Leslie Werner. I had some 3X3 inch scraps. Leslie’s matchbooks are smaller, so I adjusted accordingly. I used double-sided scrapbook patterned paper, so when opened, the matchbook would reveal a wholly different color. I stapled with the tiny attacher; I like the smaller staples. I also tamped down on the back side of the staple with a flat tool so the sharp legs were embedded and would not snag. 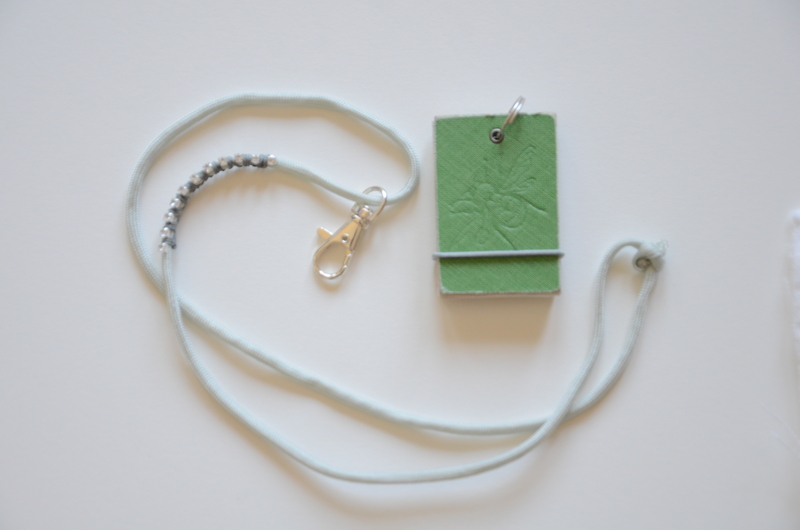 These portable little books would be fine for lists and favors. But I made one exclusively for dinner-time hang man. My husband and I recently discovered that our boys (almost 10 & almost 8) love this game, and it is great entertainment while waiting at restaurants or while traveling. matchbooks for grocery lists, and hang man games. I also made the equally simple, sewing machine-bound beveled books, designed by Stephanie Morison. Again, I worked with scrap papers. (I was given a ream of old company letterhead. The paper is a crisp, heavy white stock, and once I trim the left margin with out-dated company information, I’m left with a 5½X8½ inch block). The instructions recommend testing out 14 sheets to see if your machine can handle the bulk; mine needed some manual assistance, so next time, I’ll reduce sheets. These petite books will make useful jotters for all notes: garden seed varieties, sticker collections and wedding shower gift-listing (who gave what for the Thank You notes). palm-sized jotters for keep-able list-making. (I love hyphens). Since I had a scrap of leather, I made the petite fold journal, designed by Marie “Wee” Calogerro. More scrap paper, waxed linen thread, and two old buttons. I had attempted the French stitch binding, and I had success with the instructions, but I feared that if I pulled too hard to keep the binding tight, I might ruin the holes I punched into the leather. So I went with a straight stitch. If you’ve never sewn together multiple signatures before, you may want to find a video tutorial to see the process in action. I found that the tutorials took a broader approach, and I can see how a beginner might be flummoxed. I’m happy with how this book turned out. It’s a good size at ­­­­5½X4 inches (which is larger than the book sample), and it lies relatively flat when opened. Only one of my buttons is functional, the distressed brass one is sewn on, but solely decorative. 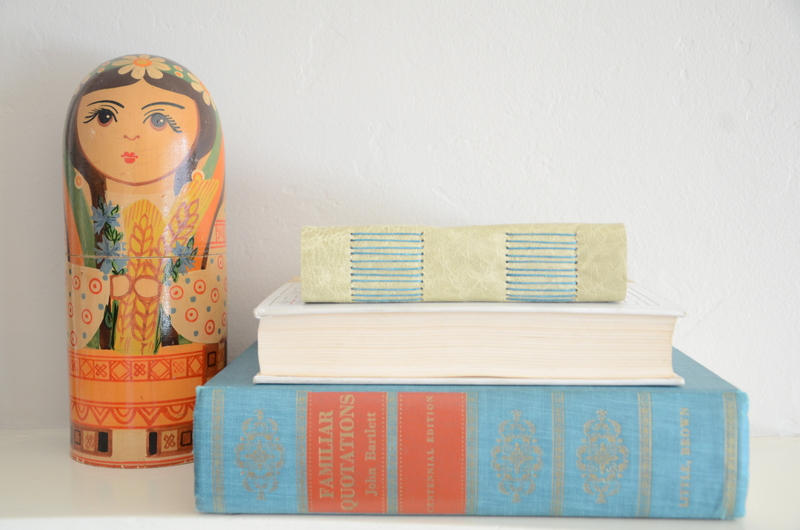 old books, book binding, & a new-to-me matryoshka. 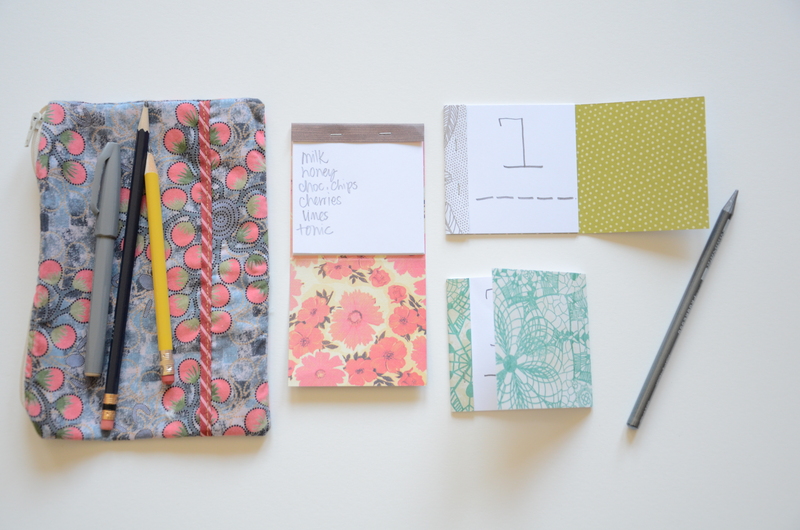 My favorite project from Making Mini Books was the book On the Go, designed by Heather Carden. I had an immediate need for exactly this type of book. Many years ago, I learned how to cross-stitch and embroider, and worked my way through monogrammed bookmarks and a Holly Hobbie wall hanging. Lately, I’m seeing great embroidery everywhere (Etsy, Pinterest, Creative Bug), and, if you’ll recall from a few posts back, I have many empty hoops. 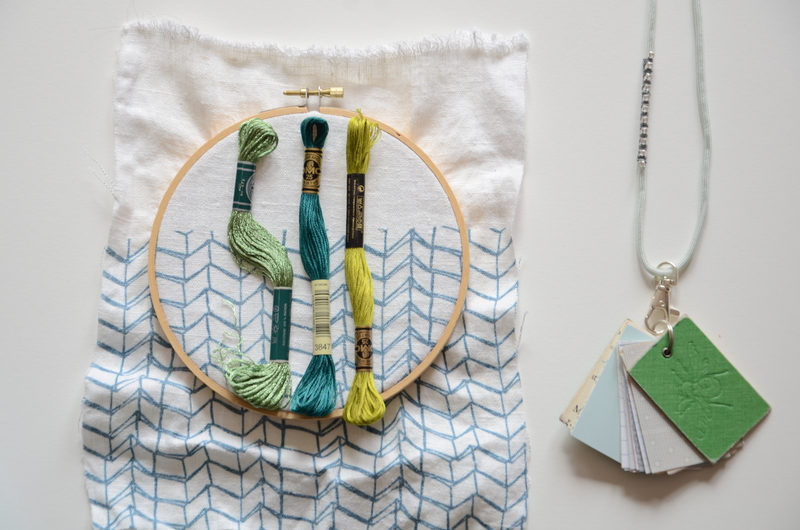 So I’m taking it up again (and reviewing a few embroidery books in the process). I had started with some simple linen and a line drawing. I wanted to take the project on a long flight. But, how to remember the stitches? Yes, simple ones are easy; it’s those fancy ones that I always jumble. I thought I could either print and cut a stitch guide and bind it into a little book, OR make a mirror image photocopy and image transfer the stitches into a book of interesting vintage papers. on the go stitch guide! and starting a new hoop. it unclips! and fastens up! The cover for my book On the Go features an embossed bee from an old book, and a mash-up of old pages inside. I used a lobster claw swivel clasp to allow me to remove the book, and thumb through the pages. The necklace portion is a length of paracord, enhanced with a portion of rhinestone chain that I simply wrapped and knotted with waxed linen thread. The book also has a band of elastic bound with a metal eyelet on the back cover. Aside from my initial stitch guide idea for this book, I plan to make a couple more for our big family trip later this summer. With this little book, I can—on the fly—record things that we don’t want to forget: observations and priceless words from our kids while exploring completely foreign turf. Further, this On the Go Book could house pictures of your beloved ones, SAT vocabulary words, knitting stitches, or twenty of your favorite quotations. The sky’s the limit. Thanks, Kathleen McCafferty, for rallying 22 crafty book-makers, and organizing a syllabus of simple to complex book projects that are diminutive and practical, and allowed me to up-cycle a stack of old letterhead, and carry on with my embroidery like an old pro. 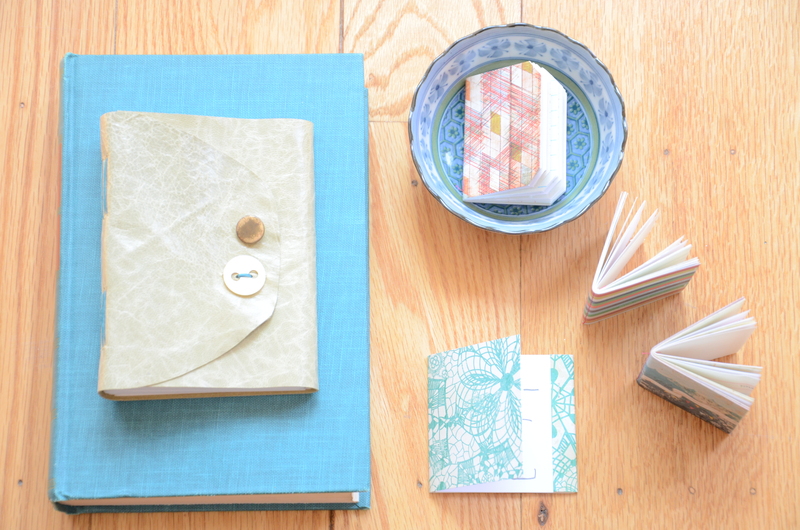 Making Handmade Books, by Alysa Golden. How to Make Books, by Ester K. Smith. And a suite of non-adhesive book-binding books by Keith Smith. PS: A couple weeks ago, I wrote about miniature faux taxidermy animals. Lest you think I’m morbid, or that taxidermy isn’t cool, I spied an article in last week’s United Airlines Hemispheres Magazine featuring a UK shop that teaches taxidermy classes! You can create your own mouse wearing a chef hat or knitting an afghan. The accessories may be faux, but the mouse is for real.